Can AI-driven Test Automation enhance Continuous Delivery? Continuous Delivery is no longer a value enhancing strategy, it is a much needed approach in software development and release lifecycle. It has substantially changed the way enterprises test and launch their applications in a volatile consumer ecosystem. The demand for Intelligent Applications is on the rise. In fact, it is predicted that almost all the applications will be delivered with embedded intelligence. It practically implies that these applications will have the capability to scrutinize historical and real-time data to deliver customized experiences and results to the end-users by leveraging Machine Learning technologies. Hence, testing these applications will need a relevant Test Automation strategy and a Continuous Delivery plan. In the current Digital ecosystem, consumers are swarmed by chat bots and virtual assistants across diverse websites and applications. These features are not only automating basic activities, but are also delivering enhanced and personalized experiences. At a recent Google conference, CEO Sundar Pichai opened the event by stating, “We’re moving from a mobile-first to an AI-first world.” Hence, due to growing business mandate and evolving consumer preferences, the need to build such robust applications is increasing by the day. It is equally challenging to conceptualize, develop, deliver and maintain these applications in an environment that demands constant updates, enhancements, along with enduring cyber risks. Eventually, the legacy applications existing within an organizational set-up need to gear up and keep up with the speed of these new application structures as well. In order to build robust applications that can deal with the growing digital challenges and expectations, it is important to leverage AI services/platforms that can bring relevance for your business objectives and support you to deliver applications at speed. AI-based Test Automation platforms enable development teams to manage testing for Intelligent Apps, offer enterprise-grade AI Infrastructure that is scalable, along with upgraded AI tools that can enable developers and data scientists to develop applications efficiently, and as per their specifications. Continuous Delivery with AI automation tools is like agile testing that happens in fragments and delivers results in shorter but frequent cycles. These tools enable testers to escape the tedious testing tasks and take up high-level issues to deal with. Hence, the overall focus shifts from being task-driven to issue-driven. Automation is inevitable in a Continuous Delivery scenario, specifically where AI gets applicable across enterprises to eliminate time-consuming tasks in the development process. At the same time, collaboration between teams is necessary, where Test Automation programmers work closely with developers, traditional testers, system architects, and members from the technical team. Only with scrupulous planning and cohesive outlook, enterprises would be able to effectively leverage the power of AI-based test automation platforms for Continuous Delivery. How effective can AI Testing get for Continuous Delivery? Perceiving Software Testing in any potential way is fathomable when we map it against its benefits and practical implications. Testing ultimately enables developers to figure out if their applications practically work in the real world, and as expected. Ultimately, it helps developers to effectively identify issues and address them within demanding time gaps. Equally critical is continuous delivery, which enables enterprises to deal with glitches within their application, rectify them, and roll out the application without any downtime or gap in experience. One of the most indispensable benefits of testing is to identify gaps in the application, which is made much more feasible with AI-based automation tools. Especially in a DevOps-driven development pipeline it is critical to identify issues and fix them immediately. 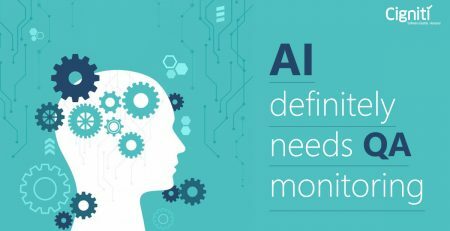 AI platforms enable testers to focus on bigger-picture issues, rather than handling minor and repetitive issues. AI automation platforms also offer the ease to testers to personalize tests with collated information. These testing solutions offer metrics that can elaborate execution cycles, active runs, and track success rates. Moreover, the analytics collected can be used to understand the issues much more in detail and further track them through the software development cycle. Whether it is the health, finance, or entertainment sector – every industry is trying to innovate and use AI-based apps that help to automate tasks. This makes testing the apps for automation a business-critical activity. However, there are multiple testing related challenges that organizations may face while leveraging AI and ML to test apps for quality. Cigniti’s Intelligent Test Case Management Strategy provides AI & ML algorithms for Test suite optimization, enables to predict the next for test suite queuing, provides, Log Analytics, Traceability, Defect analytics, Integrated Requirements Traceability Matrix (RTM), Rapid impact analysis, and Comprehensive documentation. Connect with us to leverage assured benefits of Cigniti’s Intelligent Test Case Management Strategy. 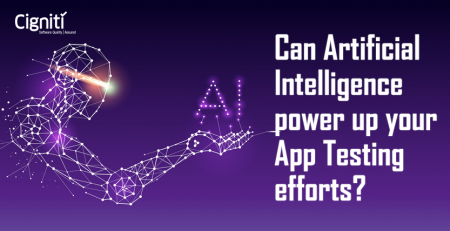 Can Artificial Intelligence power up your App Testing efforts? 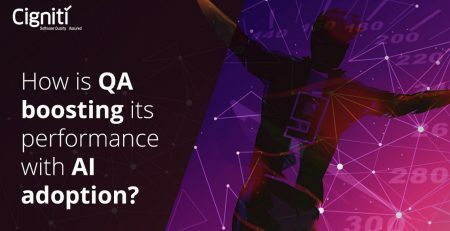 How is QA boosting its performance with AI adoption?